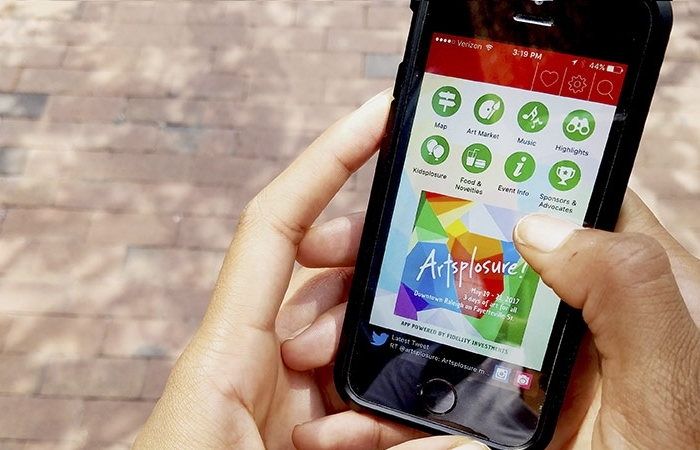 Fidelity Investments sponsoring the Artsplosure mobile app, free to guests with smartphones during The Raleigh Arts Festival. 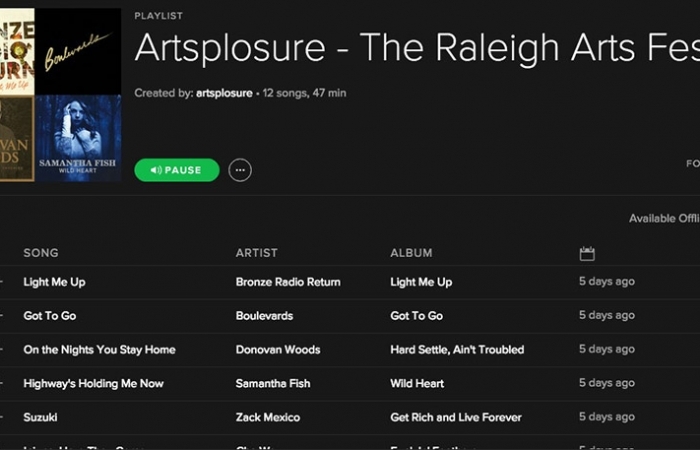 Artsplosure, the presenter of Artsplosure – The Raleigh Arts Festival, today announced that its 2018 mobile app is now in the Apple App and Google Play stores, thanks to a sponsorship by Fidelity Investments. The app, created by Blue Pane Studio, includes many tools and abilities that will ensure that attendee’s have the information needed for the ultimate Artsplosure experience. 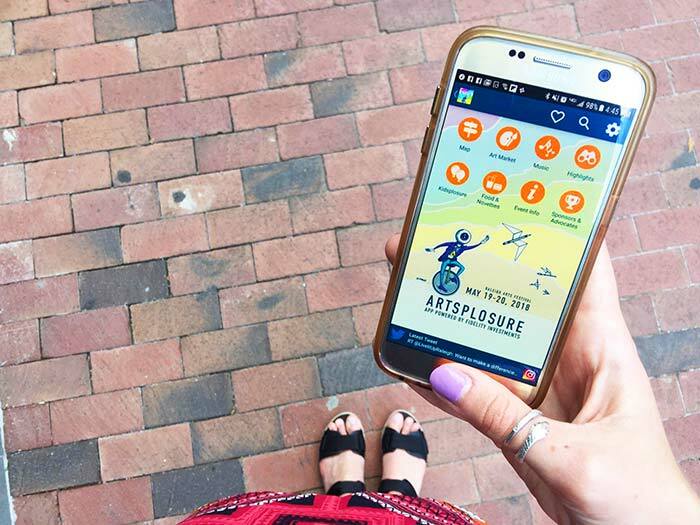 Designed to enhance the festivalgoer’s experience and navigate the festival footprint on Fayetteville Street, the Artsplosure app provides what is “on tap” for the festival weekend. From the inclusion of nearly 200 art vendors in the Fayetteville Street Art Market and a full weekend worth of music on the Main Stage to information on Squonk Opera’s Cycle Sonic and Kidsplosure activities, the Artsplosure App puts all of the happenings at your fingertips. 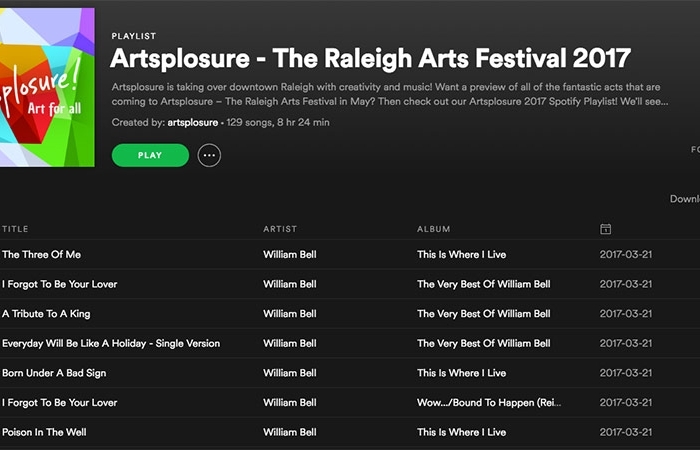 Artsplosure – The Raleigh Arts Festival spans a full weekend, May 19-20, with the juried Art Market, Squonk Opera performances, Main Stage performances and interactive activities all on Fayetteville Street. Nearly 200 visual artists will display works of metal, painting, jewelry, wood and more! This year’s headlining musical acts include The Wailers, The Last Bandoleros, Ranky Tanky, David Myles, Christie Lenée and other great talent. Kidsplosure will take place on East Martin Street between Wilmington and Fayetteville Streets, on Saturday and Sunday, and feature a plethora of crafts and youth-geared performances. City Plaza will feature Squonk Opera, a spectacle of kinetic movement, music and structural amazement. A complete list of the full line-up of visual artists, special activities and music can be found under Performances & Activities. At Fidelity, we are focused on making our financial expertise broadly accessible and effective in helping people live the lives they want — from the 23 million people investing their life savings, to the 20,000 businesses managing their employee benefits programs, to the 10,000 advisors and institutions needing innovative technology solutions to invest their clients’ money. To do this well, as a privately held company, we place a high degree of value in nurturing a work environment that attracts the best talent and reflects our commitment to being an employer of choice. For more information about Fidelity Investments, visit fidelity.com. Fidelity Investments in North Carolina is focused on customer service, benefits and retirement operations, as well as a broad array of technology functions. With more than 3,400 full-time associates in and around Research Triangle Park, Fidelity also has investor centers in Charlotte, Durham, Greensboro and Raleigh.